Technology refers to advancements in the methods and tools we use to achieve a goal. In the classroom, technology includes all kinds of tools from pencil, paper, to the use of presentation software. In coming year’s technology will be a universal language that the entire world will speak. With the changing time, teachers must integrate technology with teaching as it is imperative to note that technology is the literacy that is required in higher education and in the economy. Online collaboration tools: These tools allow students and tutors to share documents online, edit them in real time and project them on a screen. Online collaboration tools provide students, a common platform to document their ideas and present their work using text and images. Presentation software: Software’s such as PowerPoint enables tutors to embed high-resolution photographs, diagrams, videos and sound files and to deliver verbal lecture content. Course management tools: These tools helps tutors to organize all the resources students need for a class, provide valuable grading tools, and create spaces for discussion, document sharing, and many more. Lecture-capture tools: These tools allow tutors to record lectures directly from their computer, without elaborate or additional classroom equipment. Studies show that posting recorded lectures does not diminish attendance and students really appreciate the opportunity to review lectures at their own pace. Tablets: Tablets are easy to carry and can be linked to computers, projectors so that students and tutors can communicate through text, drawings and diagrams. If technology is not harmonized with teaching, then educated people will not be fitted in current digital world despite their educational accomplishments. This will make learning fun for the students and a lot easier for the tutors. Therefore, it’s important to club technology and teaching together to empower students with digitized knowledge and perform outstanding. 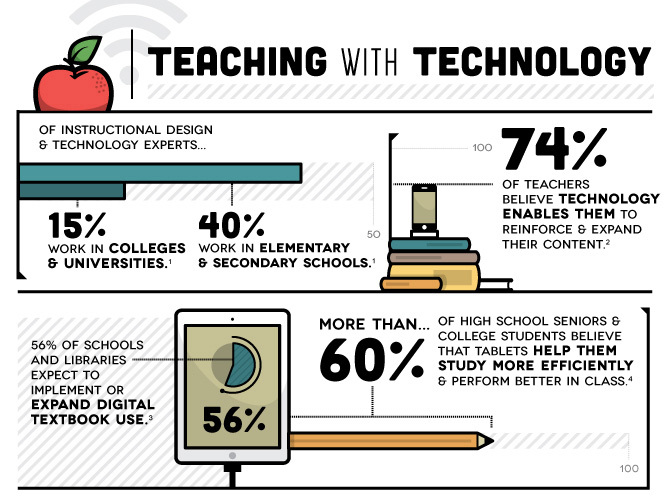 Education and Technology: Why E-learning has seen a tremendous increase? Does IQ Test Determine Success? EduBlaze Bridges Gap between Teachers and Parents with its Advanced ERP System!